1 Tuner + 1+ non-Tuner monsters When this card is Special Summoned: You can target 1 card in your Pendulum Zone; Special Summon it, also this card cannot attack for the rest of this turn. You can only use this effect of “Odd-Eyes Meteorburst Dragon” once per turn. Monsters in your opponent’s possession cannot activate their effects during the Battle Phase. A Battle Phase Monster Effect Blocker. A Synchro Monster. A Way To Special Summon Pendulum Monsters. All In One Card. 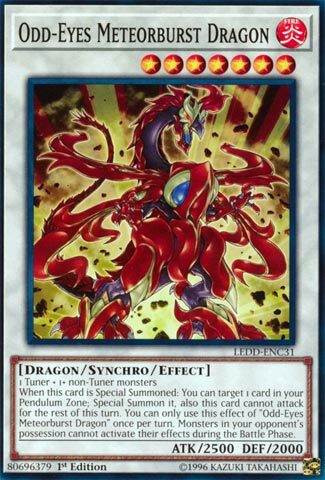 Odd-Eyes Meteorburst Dragon is a Level 7 Fire Dragon-type Synchro Monster with 2500 Atk and 2000 Def. Decent stats and great effects. The Special Summon is only once per turn, but that’s balanced. The materials are generic so any deck that runs tuners should be able to benefit from the monster effect blocker. And this blocks a bunch of effects. No Lightning, no Hand-Trap monsters, no Electromagnetic Turtle or other monster grave effects. Only during the battle phase, but still. The only downside to the first effect is it can’t attack for the rest of the turn after use. Watch out for back row. We end this week off with the Odd-Eyes Synchro Monster from the Pendulum Magician Structure deck in 2015, Odd-Eyes Meteorburst Dragon. Meteorburst requires a Tuner and a Non-Tuner, so it is generic thankfully. You can use Nobledragon Magician’s effect with an Odd-Eyes to summon this in the Odd-Eyes deck, or just play Nobledragon with the Pendulum Magicians to go with this. When he is Synchro Summoned, you can summon a Monster from your Pendulum Zone. You never know when you need to summon something out of your scales to either clear them up to place a different scale, or open up more plays in your deck. In return, Meteorburst cannot attack, but that is whatever, plus it is a hard once per turn. During the Battle Phase, monsters in your opponent’s possession cannot use their effects. This shuts down so many powerful monster effects, especially floaters and hand traps. Sure it is only during the Battle Phase, but you are still safe from monsters as you declare your attacks. This is a great generic Synchro monster, mostly because of his second effect. If your deck can summon Level 7 Synchros, which is easy with Destrudo now, you can add him in if you have room. I still love Synchro Monsters. Odd-Eyes Meteorburst Dragon has a cool name, and awesome art to match. Level 7, and again clocking in at 2500 attack, is a Fire attributed Dragon. Generically Synchro Summoned with a Tuner, and one or more non-Tuner Monsters. When Special Summoned, you can Target and Special Summon a Monster from your Pendulum Zone, which only aids the Odd-Eyes player. Meteorburst does lose his attack during that turn, but I don’t see that as a huge drawback. Selective protection here, but it’s a good place for it. Monsters your opponent controls can’t activate effects during the Battle Phase. That’s the time to stop them, or at least a very good one, no?